On Saturday 10th February, UWE Bristol hosted the regional heat of the Client Interviewing Competition. The Client Interviewing Competition is a competition for Law students, who in pairs interview and advise a client on an unknown legal problem. This year 39 teams throughout the country entered the competition. UWE Bristol welcomed 12 different Universities to the regional heat. The Bristol Law School (BLS) team, consisting of Josie Hebestreit (LPC) and Adam Hobson (GDL) came 2nd in the competition. They will now take part in the National final which is being held in London in March. If the BLS team is successful at the nationals, they will go through to the international competition which is in Maastricht this year. Senior Law Lecturers Suzaan Rowley and Victoria Latimer with the help of the UWE Law Society, offered training sessions to any BLS students who wanted to compete in the competition. Adam and Josie as UWE finalists went on to be coached by Suzaan and Victoria and were chosen to represent UWE at the regional competition. This was the first time UWE Bristol had entered a team into the competition. 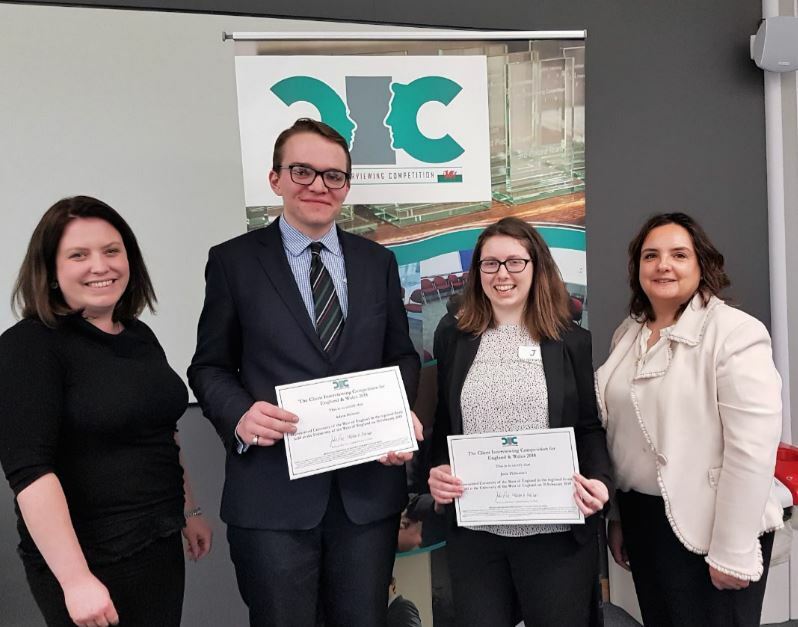 Josie and Adam faced stiff competition from other universities including University of Bristol, University of Law and Cardiff University. The pair were placed 2nd after Oxford Brooks and will now join 9 other teams at the national competition. Congratulations to Adam and Josie!